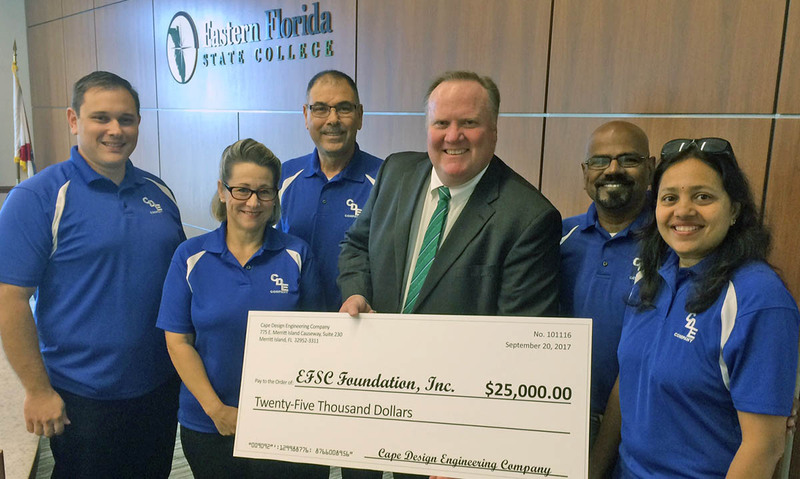 September 2017 – Cape Design Engineering Co.
As Eastern Florida State College develops new and innovative programs at the Health Sciences Institute, CDE has created a scholarship for deserving students. At the EFSC’s Foundation’s meeting in September the firm will present a check for $25,000. This amount will be invested by the Foundation and the earnings from this investment will fund Health Sciences Institute scholarships in perpetuity. The CDE Scholarship will be awarded to a Florida resident, enrolled fulltime in their program of study at the Health Sciences Institute and must maintain a 3.5 GPA. CDE’s founders Lutfi & Peggy Mized, Kannan Rengarajan, and Rama Kannan established CDE to provide professional engineering design, design/build, and construction services. As we celebrate our 20th year in business, CDE continues to offer the highest quality services to our clients in educational, health care, commercial, and industrial sectors, as well as the federal government and Department of Defense. 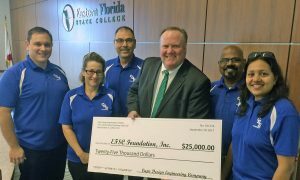 CDE started an energy study along with FPL services for Eastern Florida State College in 1999 (when it was known as Brevard Community College). In the last 18 years since, CDE continues to work diligently with the institution to provide high quality engineering designs, delivered on-time, and within budget. CDE’s impact has helped save the College millions of dollars in energy costs, enhanced performance of equipment and facilities, as well as contributing to a productive, inspiring, and safe place for those in the community to learn. One of CDE’s most prestigious projects for Eastern Florida State College was the mechanical, electrical, and plumbing design of the new Health Sciences Building on the Melbourne Campus. CDE realizes the impact this new state-of-the-art teaching facility will make on the community and is proud to have again helped Eastern Florida State College, a true cornerstone of Brevard County, provide a place to train and produce the next generation of health care professionals. CDE’s vision is aligned with Eastern Florida State College – we believe in the power of community and education. We view the establishment of this scholarship as a duty to help the very community that we live in and we could not be prouder to do so. It is our hope and desire that this scholarship will not only help Eastern Florida State College promote higher education but will also help to raise up the next Titans of our community. and capabilities, please visit www.cdeco.com. © 1997-2016 Cape Design Engineering Co.. All rights reserved.